Attention all Pharmacy students! Have you been looking Jobs for B Pharmacy? If your search is still going vacant, it’s a promise now it won’t. Here at Chekrs you can search all the Jobs for B Pharm Freshers and even for experienced within a few clicks. Enrollment in government sector is not less than a boon. For all those who are worried or don’t have any knowledge about the B.Pharma Sarkari Naukri are informed to stay tuned at Chekrs. Here you can meet lots of B Pharmacy Government Jobs which can add value to your position. Chekrs strive to provide you the information about Sarkari Naukri for Pharmacist belonging to the central and state level. The medical sciences even in India are touching various reformatory heights. If you have graduated from the course possessing fair knowledge, ample options are lined for you. However to make sure you receive B Pharm Job Opportunities easily, Chekrs completes the task on your behalf. We bring you the notification coming from prestigious medical groups like Glenmark, Ranbaxy, P&G, etc. fulfilling your expectations of bright future. Why Chekrs for B.Pharma Upcoming Jobs? To further ease your difficulty in receiving the Latest Jobs for B Pharmacy instantly, you can choose the option of subscription available for free. We come up with the solutions that match the preference such as B Pharma Jobs in Mumbai, Chandigarh, Delhi, Bhubaneswar, etc. 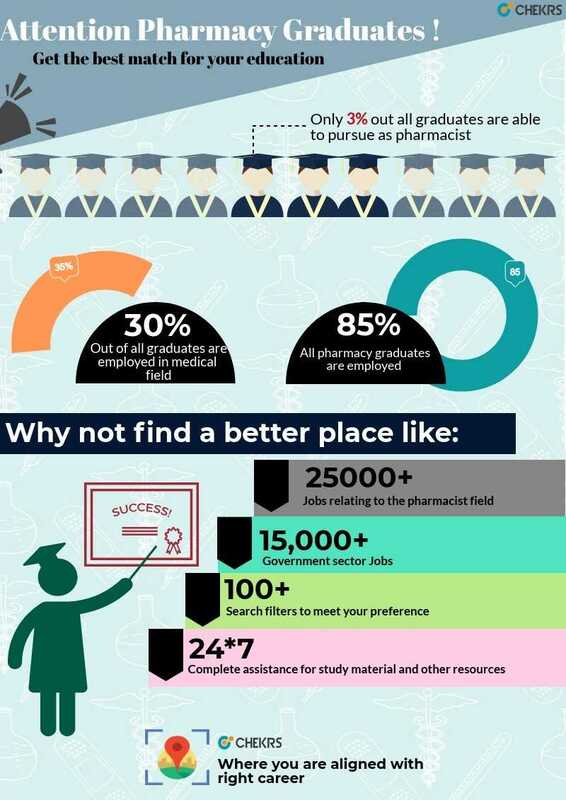 Also the competition is not so easy when your search is Jobs for B Pharmacy Freshers; to make sure that you succeed we provide very useful study material to compensate both government and private sector levels. You can easily brush up your skills and deepen your knowledge with the model, sample and previous papers aided with the online quizzes and the online mock tests.